When Grammy award-winner Kenny G took the stage in front of an estimated record-breaking audience of more than 50,000 people at the 27th Annual Syracuse Jazz Fest, he proved he was more than a headlining act. He is a music legend. With over 75 million records sold worldwide, he has been named the 25th highest selling artist of all time in the United States by the Recording Industry Association of America. Decades after his first album was released, he continues to tour internationally, inspiring a new generation of music lovers everywhere. His timeless renditions of “Auld Lang Syne,” “Have Yourself a Merry Little Christmas” and “The Wedding Song” have become instant classics, making him a perennial favorite at weddings, holiday gatherings and New Year’s Eve celebrations. 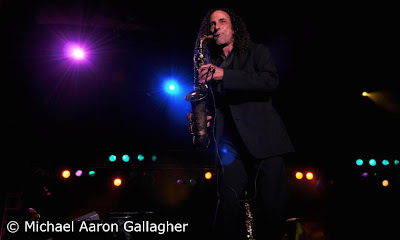 On June 27, Kenny G returned to Syracuse, New York, a city he has performed in many times before, to join a prestigious list of entertainers, including Aretha Franklin, BB King, Dizzie Gillespie, Ray Charles, Diana Krall and Chaka Kahn, all of whom have headlined the Syracuse Jazz Festival, which is the largest of its kind in the northeast. The audience fell silent and then suddenly erupted with applause as the piercing sounds of Kenny G’s saxophone sliced the nighttime sky. The spotlight came to rest on a point far off into the crowd, where he stood, the light sparkling off his trademark soprano saxophone, while he played his opening song “Home.” With jaw-dropping precision, he demonstrated his mastery of circular breathing, holding his final note during “Silhouette,” as he slowly made his way to the concert stage like the pied piper, mesmerizing the crowd as they parted around him. The dizzying arrangement of intricate notes and beautiful melodies was breathtakingly supreme. 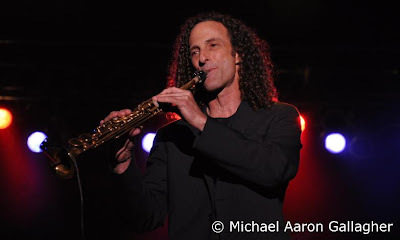 As one of the most influential saxophone players of all time, Kenny G is able to do things on the instrument that other musicians wouldn’t even have thought possible. With unrivaled success in the United States, winning both the American Music Award for Favorite Adult Contemporary Artist and the Grammy Award for the Best Instrumental Composition in 1994, and receiving countless award nominations since, he has proven that even after 20 years of touring countries like China, Japan, Malaysia, Singapore and the Philippines, he is still an international sensation. “I’ve got to say, in Asia, I think my music may be even more popular there than it is in the States,” he said. 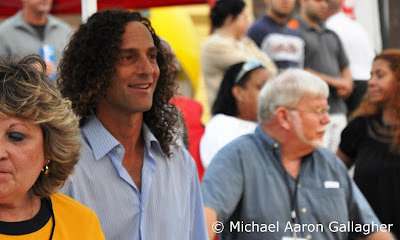 Even though he is a household name, Kenny G still manages to be a nice guy, generously taking time to respond to questions from his fans and sign autographs before and after his concerts. With his own line of alto, tenor, and soprano saxophones, greatest hits compilations, and a thriving world tour, he is keeping smooth jazz popular and proving to a new generation of listeners that the sultry sounds of the saxophone are still alive in modern music. From the romantic, soft flowing melodies of smooth Jazz and R&B, to Latin inspired arrangements, like those found on his most recent CD entitled, “Rhythm and Romance,” which only took him three months in the studio to record, a Kenny G album is sure to capture the mood. Whether he is piloting an aircraft, or playing the saxophone in front of an audience of thousands of devoted fans, Kenny G is still soaring and reaching new heights. For more information about Kenny G’s music, including how you can obtain a personally autographed CD, visit his official Web site at http://www.kennyg.com/. Also published in newsprint by Scotsman Press, Inc.
To request permission to use excerpts from “Stay Famous by Michael Aaron Gallagher” or to quote StayFamous.Net on television or in print please contact Manhattan Public Relations.